Before treatment begins, a thorough survey of the infested site is an essential key to success when using any rodenticide. Environmental changes which could be made to reduce the attractiveness of the site to rodents should be noted for implementing after the treatment. Usually this will involve rodent proofing and removing rubbish and weeds that provide harbourages and cover. However, the site should not be cleared before treatment since this will disturb the rodent population and make bait acceptance more difficult to achieve. Obvious food, such as spilled grain, should be removed as far as possible and any food sources covered. Rodenticide baits should only be used for as long as is necessary to achieve satisfactory control. In most cases, any anticoagulant bait should have achieved control within 35 days. Should activity continue beyond this time, the likely cause should be determined and documented. If bait continues to be consumed without effect, a more potent anticoagulant should be considered. If bait take is poor, relative to the apparent size of the infestation, consideration should be given to re-siting the bait points and possibly changing to another bait base, as well as making other environment changes. A simple site plan or location list identifying areas of particular concern pertinent to the site should be drawn up and retained on file. A record of all bait points and the amount of bait laid should be maintained during the treatment. Activity should be noted at each bait point, including any missing or disturbed baits, as the treatment progresses. By carefully recording the sites of all bait points, responsible users of rodenticides are able to return to these sites at the end of the treatment and remove uneaten bait so that it does not become available to wildlife. Users should follow the label instructions regarding the size and frequency of bait points and the advice given regarding the frequency and number of visits to the site. By using enough bait points the rodent control treatment will be conducted most efficiently and in the shortest possible time. This will restrict the duration of exposure of non-target animals to a minimum. The bodies of dead rodents may carry residues of rodenticides and, if eaten by predators or scavengers, may be a source of wildlife exposure to rodenticides. It is essential to carry out regular searches for rodent bodies, both during and after the treatment period. Bodies may be found for several days after rats have eaten the bait and rats may die up to 100 metres or more away from the baited site. Any rodent bodies should be removed from the site and disposed of safely using the methods recommended on the label. 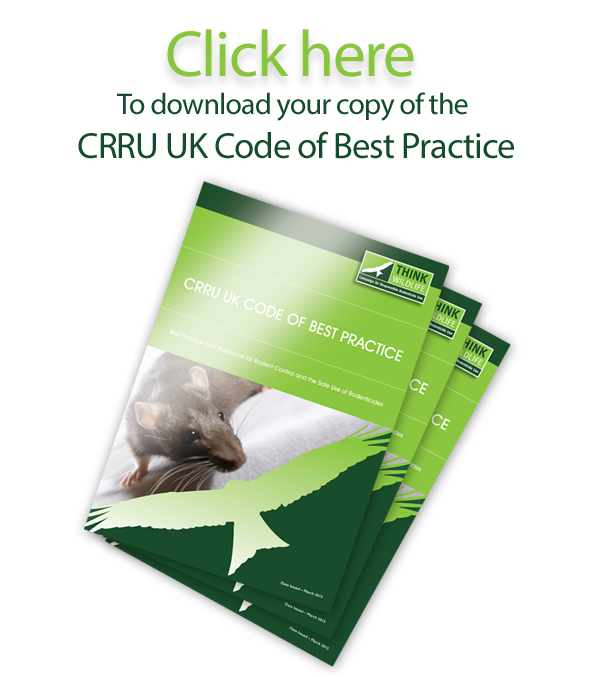 Care should be taken to ensure that bait is sufficiently protected to avoid accidentally poisoning other mammals and birds. Natural materials should be used where possible. Bait stations should be appropriate to the prevailing circumstances. They should provide access to the bait by rodents, while reducing the risks of non-target access and interference by unauthorised persons. They should protect the bait from contamination by dust or rain. Their design, construction and placement should be such that interference is minimised. Where the risk assessment or treatment records show that multiple visits are required, then those should be made as frequently as is considered necessary. Daily inspection may be required in some circumstances. At each visit, baits should be replenished according to the product label and a thorough search made to ensure that bodies and any spilled bait are removed and disposed of safely. Records of such visits should be maintained. Never leave bait down at the end of the treatment. Bait left out at the end of a treatment is a potential source of contamination of wildlife. On completion of the treatment, records should be updated to signify that the infestation is controlled and that, as far as reasonably practical, all steps have been taken to ensure that the site is now free of rodenticide bait.